Square Enix will be showing off Deus Ex: Human Revolution in public for the first time at Yahtzee's Mana Bar. When it was announced that Duke Nukem Forever was going to be playable at Yahtzee's Mana Bar in Brisbane, Australia, I was a little sad that the establishment was located so far away. Now that Square Enix has announced it'll be bringing Deus Ex: Human Revolution to the Mana Bar for the game's world first public appearance, I think I'm going to have to move. Choosing your plan of action through the various situations of Deus Ex's futuristic world could only become more fun by doing it with friends and getting a little tipsy (if you're of age) at the same time. If you're lucky enough to live in Australia, Square Enix will be allowing this to happen with the game on display at the Mana Bar this Saturday, October 23. Whether the game will be playable or not isn't clear, but Square Enix did announce that it'll be holding a demonstration of Human Revolution starting at 7pm, followed by an exclusive video from the developers. 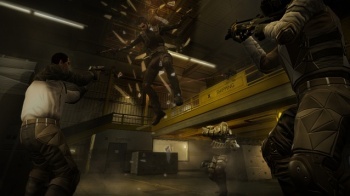 There will also be various Deus Ex competitions, with prizes given away throughout the day. Deus Ex: Human Revolution is the third Deus Ex title, but it takes place 25 years before the first. Deus Ex, originally designed by Warren Spector and released in 2000, became known for its RPG-like gameplay implemented within a first-person shooter that gave players the freedom of choice in many situations. One could run-and-gun, sneak through vents and strategically take out enemies, or hack into enemy robots to cause chaos. Square Enix has Deus Ex under its control after acquiring Eidos last year. Human Revolution's trailers look absolutely gorgeous but we haven't seen too much of its actual gameplay yet. Maybe some helpful Australians can fill the rest of us in on what Square Enix shows off this weekend, if they don't get too drunk to remember the demonstration.